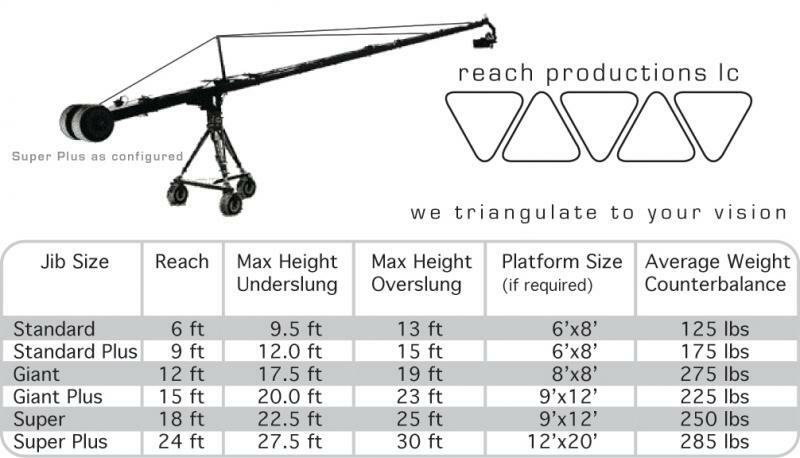 Jimmy Jib Triangle: Modular from 6 feet up to 40 feet in reach. Total maximum length 50 feet. with 4K/UHD/2K/HD monitor, 4K playback and 4K recording support! Just about any camera under 50lbs can be mounted. For professional cameras, we typically use 3 inch 3/8 inch coarse thread camera knob mount. For prosumer, handycam variant and DSLR type cameras... 4 inch 1/4-20 mount is the standard. Please specify what type of camera and lens (preferably the camera/ lens name and model number) and accessories such as a wireless focus kit, batteries, mics and or matteboxes and etc to be used. For video feed and power, please refer to above monitor specs as provided. The jib can comfortably fit in most soundstages, convention centers, lecture halls, sporting arenas, clubs, stores, homes, beaches, golf courses or anything in between! Whether shooting indoors or outdoors, just let us know what dimensions of the room, door or opening widths and ceiling height are, and what obstacles (ie: trusses, trees, bridges, waterways, signs or electrical lines and poles) or concerns that you may have and we can go from there! Please refer to the chart below with typical 25 lb payload for ENG camera and lens for easy reference. Platform size is the footprint generally needed for jib to swing back & forth 180 degrees to complete necessary shots. Counterweight will change depending on weight of camera and lens as well as accessories. Maximum payload at remote head is 50lbs. If using a raised platform, the load will be a bit dynamic since the jib will swing back and forth as well as up and down and it will also be dependent on the speed of the camera flying; the load will shift constantly. A fully rigged jib with maximum 30ft length, with operator and jib assist/ tech is on the platform, please estimate the platform's load to be at 2,000 lbs to be on the safe side. ** note: rickety or old unmaintained platforms may be shaky and unsafe, this may also affect shots. Safety is paramount! Not only for crew & personnel, gear too! How long will jib be ready? Approximate build time is listed below, not including time for unloading and loading, unpacking and packing, and transporting to specified locations. Please add 15 minutes to build times for film cameras with wireless focus for lens calibration, filters, accessories and balance, otherwise its about 5-10 min for most video cameras. If requesting the "GATORCAM" as a mobile offroad for Jimmy Jib Triangle jib on Gator positioning platform, please add 20 minutes to the above times. If the project requires off road/rough terrain Steadicam setup, please inquire about the "STEADIGATOR" for front and/or rear Steadicam setup. If shooting takes place in crowded areas, please kindly consider stanchions/barriers (refer to platform size chart to the left for reference), raised staging platforms or using available PAs for crowd control for safety's sake. Jib requires AC power, usually indoors is not a problem, shooting outside can be, but we have that taken care of that with our solution: a 1000 watt HONDA Whisper Quiet generator is available upon request. Jib needs about 10 amps of power for remote head pan and tilt, control box and multiple HD monitors. Travelling abroad? No problem! We have our passports and documentation for customs at the ready!